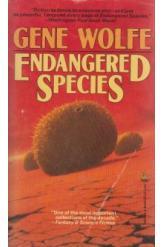 Endangered Species by Gene Wolfe Sci Fi. Book in a good condition, all pages intact. This book is a collection of 34 stories by the author, sci fi stories as dense and as powerful as a neutron star. One of the best collections of sci fi stories of it's time.